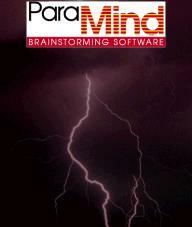 ParaMind Brainstorming Software can help anyone get the best names for their product or company. ParaMind helps the verbal brand name process by automating the combination of words with each other. ParaMind Brainstorming Software was started in 1992 and offers the original software for combining words with each other or parts of words with each other. Many brand name consultants probably use ParaMind for their creation of the hundreds of brand name choices they give back to you. Don't worry if you can't afford to hire an expensive name brand consultant when you can chose your own names based from looking over thousands or tens of thousands of ParaMind word interactions. See our examples section for how ParaMind creates new name brands. New name brands are created from old words recombined and sometime merely parts of speech (part of a word that has no meaning by itself). ParaMind has available 1150 Word Categories, each of which has up to 22 words each. These are used to combine with your sentence in their appropriate place. Your sentences nouns are replaced with the Word Categories nouns, or your setences verbs are replaced with the Word Categories verbs. You can create as many new Word Categories as you wish and combine them in a few minutes into literally tens of thousands of Word Combinations. This works best with the ParaMind Professional Version -- other versions produce less combinations in one brainstorm.